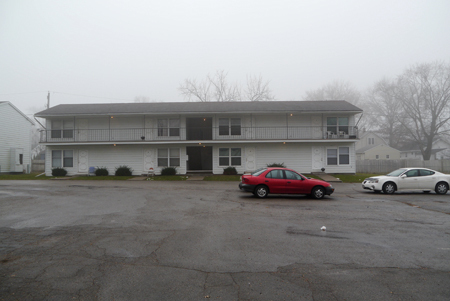 Federal prosecutors say Chicagoans were dealing heroin on streets like this in Waterloo, Iowa. It was a hopeful start and things were good there, for a while anyway. Johnson walks from the kitchen past the bathroom to the dining room (her apartment is a typical layout for a Chicago 2-flat.) Her bedroom is just off the dining room and on the windowsill she keeps a plaque. It was awarded to her husband Lusta and is a reminder of those good times in Iowa. “This is the plaque from Tyson that Lusta had got and it says ‘for five years service,’ but he actually worked there about seven years,” she says. But things went sideways. Her husband is addicted to heroin, has been since the late 70s. She has also struggled with addiction, as have other members of the family. In Iowa, in addition to working new jobs at Tyson, they bought and sold heroin. Now Johnson’s son is doing 15 years federal time. Her sister-in-law, 15 years federal time. Her nephew is doing life and her husband Lusta is facing trial and likely a similar fate. “Lusta Johnson distributed heroin,” says federal prosecutor Lisa Williams in an interview at the new glass-and-stone federal courthouse in Cedar Rapids, Iowa. Williams has indicted much of the Johnson family and knows their stories well. “They all long before they came to Waterloo had heroin habits. And so when they got to Waterloo the heroin habit didn’t go away just by crossing the state line and so they found themselves back into distributing heroin, obtaining it in Chicago and using it as well,” Williams says. In the Johnson case Williams says they would bring back heroin in amounts of 10, 15, sometimes 20 or 30 grams. To get an idea of what that looks like, Williams says one gram of heroin is about the size of a pencil eraser. “And so you would take 30 of those eraser tops and that would be 30 grams. It would fit in your palm about so it’s not a huge quantity but it’s still a significant quantity,” said Williams. It’s also profitable. Williams says a gram goes for about $100 in Chicago; a four- or five-hour drive to Iowa doubles its value. So 30 grams would be $3,000 in Chicago and $6,000 in Iowa. But there’s more. Williams says that $3,000 of heroin in Chicago can be worth $12,000 or $18,000 in Iowa. In addition to the Johnson case, Williams is prosecuting other Chicagoans who moved out to Iowa and sold heroin, 36 cases in all right now. And there are others. Sergeant Dave Dostal of the Cedar Rapids police department stands on the curb in an older neighborhood in Cedar Rapids close to the central part of the city. The houses look like the houses in many other Midwestern towns, foursquare homes that could be beautiful but many of them are run down. 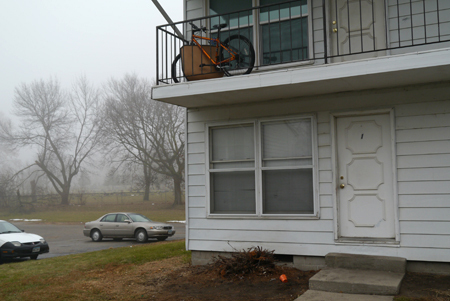 Dostal points to a house with an appliance sitting in the front yard and says two guys from Chicago moved there and started selling heroin, and cars would be driving up all day. “Classic drug trafficking signs, you know, short term traffic,” says Dostal. Cedar Rapids is not like Chicago where guys are standing on the corners. Here, you need to know someone. Dostal says police made some buys by calling the dealers on cell phones and then meeting them, sometimes at a Laundromat just across the street. “We’d set up surveillance and photograph as the individuals would come out of this house, walk over, transaction would be completed and then that individual would walk back to this place,” Dostal says as he points between the house and the Laundromat. But Dostal didn’t arrest them for making small individual sales. He was putting together a larger case. “What happens is, if they’re selling out of one specific house and your surveillance is done long enough and you get probable cause for a search warrant, you’re going to get them and all their product and maybe money,” he says. That means more serious charges and heavier time. Dostal says the surveillance of this house was part of a case that led to federal charges for 11 more people bringing heroin from Chicago. Dostal says Cedar Rapids isn’t a drug hub like Chicago. No one’s moving heroin through Cedar Rapids, it’s the end of the line. According to the DEA in Cedar Rapids, there have been 200 heroin overdoses in Northeastern Iowa since 2007, and 50 of those overdoses resulted in death. One of those people was Jon Jelinek’s 22-year-old son Sam. 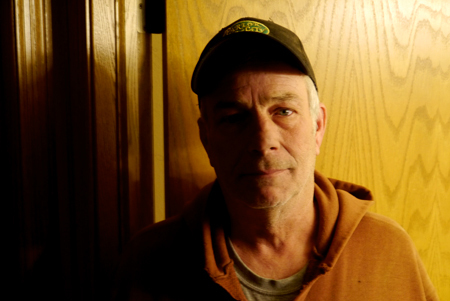 Jelinek learned about his son’s heroin addiction when Sam was arrested once. Jelinek helped him get clean and stuck with him through a relapse and an overdose. And they talked. Sam told him his heroin was being brought into Cedar Rapids by two cousins from Chicago. On March 22 of this year Sam didn’t show up for work. He worked at the restaurant Jelinek owns and Jelinek called him. “Didn’t get any call back. Had lunch and then about 1:30 felt something in my stomach saying something ain’t right so I jumped in my truck, and I knew all the way out here, I knew he had overdosed,” Jelinek says. Sam’s room was locked so Jelinek kicked in the door. “I found him kneeling on his knees, with his head in his pillow, like he was trying to get up out of bed, the needle was still in between his fingers,” said Jelinek. Jelinek looks down and sees a belt on the floor and picks it up. “This is his tourniquet. They put it just like you see on T.V. Put it around, bite it and pull it, so they get that vein sticking out.” He pauses, silent. “It’s just sad that it come to that,” he finally says. Jelinek blames the dealers. He says his son was trying to get clean, but because dealing in Cedar Rapids is all done by cell phone the dealers had Sam’s number and they texted him that they had a new shipment in. It must have been too much to resist. Back on the West Side of Chicago, in her second floor apartment, Connie Johnson weeps in her kitchen. She weeps because much of her family is going to be in federal prison for many years for dealing heroin. But she also weeps because of all the harm heroin has done to her and her husband; there have been decades of addiction, poverty and homelessness. She says heroin is an ugly thing. And I ask her, if the authorities don’t lock up the people dealing, people like her son and husband, what should they do to stop this ugly drug that kills people and ruins lives? Through tears she says she wishes she knew the answer. The Chicago Reader’s Mick Dumke contributed reporting for this story.